If you are suffering from jaw pain or tightness, you may have temporomandibular joint disfunction (TMD). 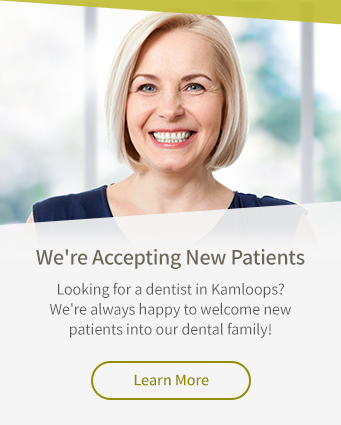 Our Kamloops dentists can diagnose and help treat this debilitating disorder. Temporomandibular joint dysfunction (TMD) is a common condition of the jaw joint disorder that is characterized by severe headaches, jaw pain, teeth grinding (bruxism), and an intermittent ringing in the ears, among other things. TMD symptoms often worsen during periods of prolonged or unexpected stress, and more intense outbreaks of the condition can lead to neck pain and even dizziness. Teeth grinding is a particularly common symptom, and usually occurs during sleep. Teeth grinding can eventually erode the structure of the teeth, resulting in more severe dental problems in the future. Untreated TMD can be a factor in eroded jawbones and loose teeth. Your dentist can test for and diagnose TMD, and provide an immediate plan to treat its underlying causes. The most common cause of TMD is a bad bite, which is essentially a misalignment of the teeth and or jaw. Your dentist may be able to realign or adjust the teeth without surgical intervention, and this may lessen the headaches, jaw pain, and dizziness that come with TMD. If you are experiencing the symptoms of TMD, visit the dentist for an exact diagnosis.